Reason 1 - Family and Friends are here. However good your overseas job is and however long you have lived abroad there is a natural tendency to return to your roots for the big life occasions. Plus, it is usually not hard to convince a few good mates to come to spend some quality time in Oz with you and to be part of the event. Or... maybe you have friends and family who have already moved to Australia and keep telling you how beautiful it would be for your wedding. Who could resist the idea of a beach or country wedding in Australia when doing their wedding planning in a cold grey northern hemisphere winter? 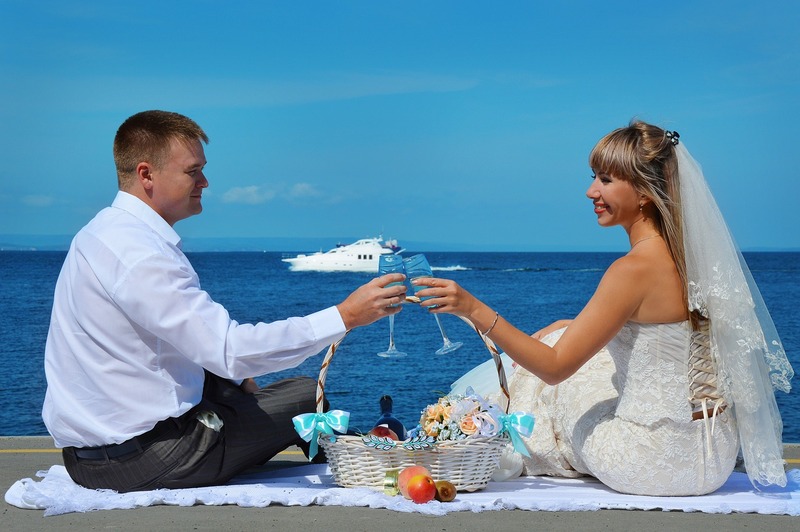 Add thoughts of a honeymoon visiting the iconic destinations of Australia and New Zealand or even a round-the-world trip and the whole idea of an antipodean wedding starts to look great. Don't be surprised though when your celebrant insists that you have a back up plan for bad weather - it does happen! It is hard for couples who fall in love and only one is Australian and allowed to live here permanently. The process to bring a prospective life partner to Australia can be long and expensive. For many couples getting this visa is the sacrifice they make to ensure that they can marry in the place they choose as their future home together. Australian civil weddings can be truly inclusive with a beautiful blend of cultural traditions. Please note that getting married in Australia or to an Australian does not automatically give you the right to stay in the country. Australian civil marriages are so varied. Everyone can have exactly the wedding they want. Date, day of the week, time of day or night, any location – indoor or outdoor, number of guests, style of ceremony, content of ceremony. Every aspect of the ceremony can be chosen by the couple. (Of course the celebrant will make sure the legal requirements are met!!) It is easy to contact and work with a civil celebrant to do all the planning over the phone or internet. We'll make it even easier - click HERE to find a CCN Celebrant in your area. Just remember that you have to give your celebrant a properly completed legal notice of intended marriage at least one month before the ceremony – so anyone planning a wedding from overseas should be in touch with their CCN celebrant as early as possible to make sure they can meet the legal requirements and have plenty of time to plan their big day. Contact a celebrant from the Civil Celebrations Network to make your Australian wedding dreams come true.